Is it time to retire the 600T? Can you believe that it has been five years since Corsair made its entry into the PC chassis market with the launch of the gargantuan Obsidian Series 900D? That was a case designed to be noticed, and it wasn't long before the firm followed-up with the eye-catching Graphite Series 600T. Those initial chart-toppers helped establish Corsair as a go-to provider of chassis solutions, however early success is arguably the easy part: staying on top is the real challenge. 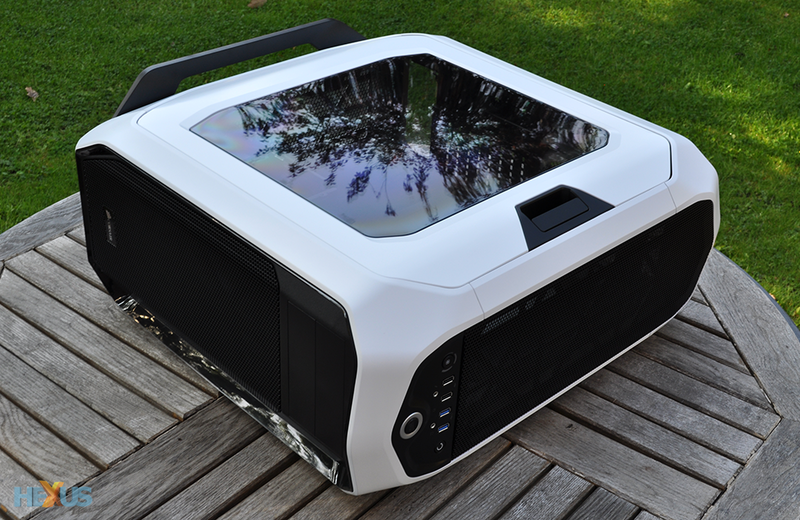 And has Corsair managed to do that? The company's product line certainly offers more choice than ever before, but you could argue that recent additions haven't quite lived up to the lofty expectations set by the original designs. The Graphite Series 600T for example remains a favourite in the HEXUS labs, but the 230T was too basic in comparison, the 760T didn't quite tickle our fancy and the 380T wasn't perfect, either. We've yet to meet a worthy successor, but Corsair reckons that will change today with the introduction of the Graphite Series 780T - a case it describes as "the next generation of the popular, award-winning 600T." Priced from £140, the 780T costs roughly the same as the 600T but offers consumers greater scope for high-end, enthusiast builds. Indeed, getting the 780T out of the box reveals that this isn't strictly a like-for-like replacement for the 600T, as Corsair's latest is significantly bigger, measuring a massive 602mm x 288mm x 637mm in size. That's almost 100mm taller than the 600T, making the 780T a full-tower solution with a highly flexible interior - more on that shortly. But first and foremost, the Graphite Series has always been dressed to impress, so how does the new addition shape up? Well, we reckon it's an aesthetic improvement over the 760T - we never quite got to grips with those large, swinging doors - however the 780T isn't going to be to everyone's liking. 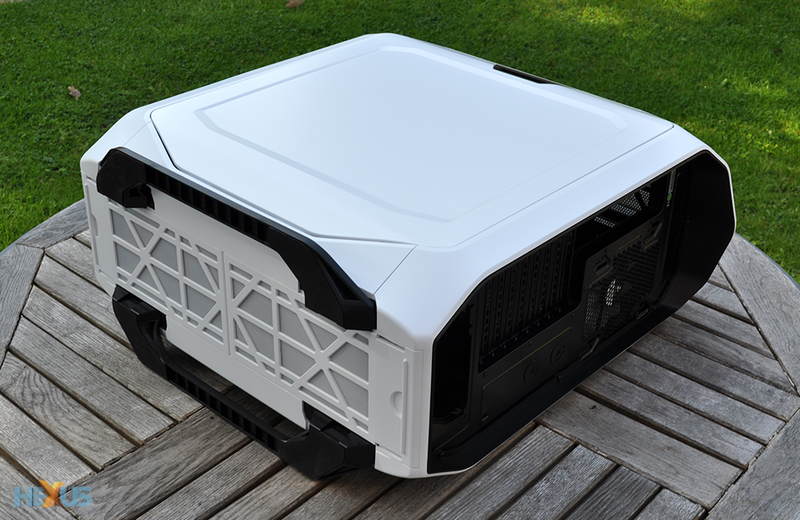 Don't underestimate the size of the case - it really is a giant of a PC chassis, bigger than the Obsidian Series 750D in fact - and as a consequence it lacks the refined feel that the 600T was able to convey. Nitpicking certain elements, we aren't particularly keen on the implementation of the two front-facing 5.25in bays. The two plastic cutouts are at odds with the rest of the forward panel, and the whole front fascia doesn't flow as well as it did on the 600T - which, remember, had four 5.25in bays integrated seamlessly into a top-to-bottom mesh column. However, while we do still cling to the size and appearance of the mid-tower 600T, there are various improvements to the 780T that make it better in other regards. The top I/O panel is a good example - it looks very stylish, has backlit buttons for ease of use in dark environments, and the start/stop power button gives it that race-car finish. Then again, while the I/O panel is visually attractive, it won't have escaped your attention that the ageing 600T offers more USB ports (five, albeit with only one of the SuperSpeed 3.0 variety) as well as FireWire. You win some, you lose some, though in truth, we've never once used the FireWire port on the 600T, so we don't imagine we'll miss it. What we do appreciate is the built-in fan controller so we're pleased to see one featured as standard in the 780T. Controlled by a single backlit toggle switch, this supports up to five fans and allows the user to quickly alternate between low, medium or high operating modes. Simple and straightforward, right? Well, not quite. During use, we've discovered that the fan controller doesn't remember the last-used setting, and as a result any connected fans revert to full speed when the PC is turned off and back on. A frustrating oversight, we feel, yet we've been informed by Corsair that this behaviour is by design. 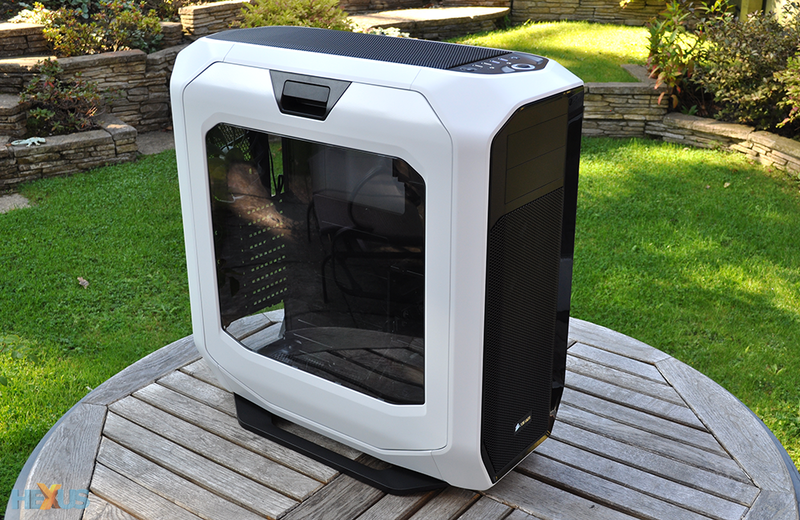 Elsewhere, and as expected, Corsair will make the 780T available in the same colour options as the smaller 380T. 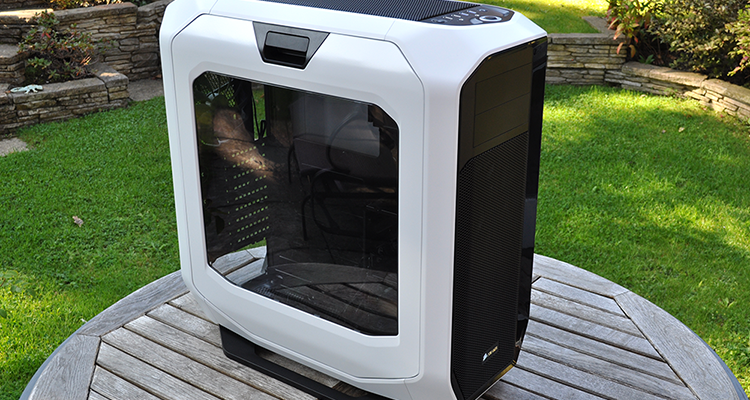 That means white with white LEDs, black with red LEDs or yellow with white LEDs. It has to be black or white for us - yellow is far too garish for our tastes - and the good news for fans of the white 600T is that Corsair's paintwork appears to be just as good. This is a bright, brilliant white with a consistent finish between panels. 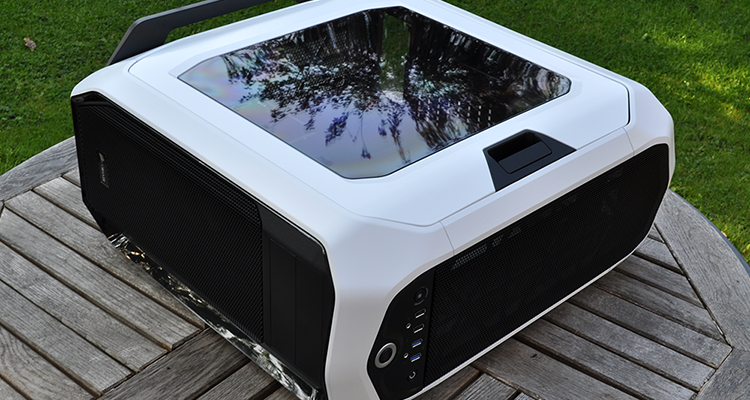 We're fond of the curved exterior, as it offers something very different to the squared, angular Obsidian Series, and the overhang on the top ends comes in handy when carrying the case from A to B. Pop-out mesh filters line the top and front and come away easily for cleaning, and access to the chassis' innards is made available via a pair of quick-release, tool-free side panels. 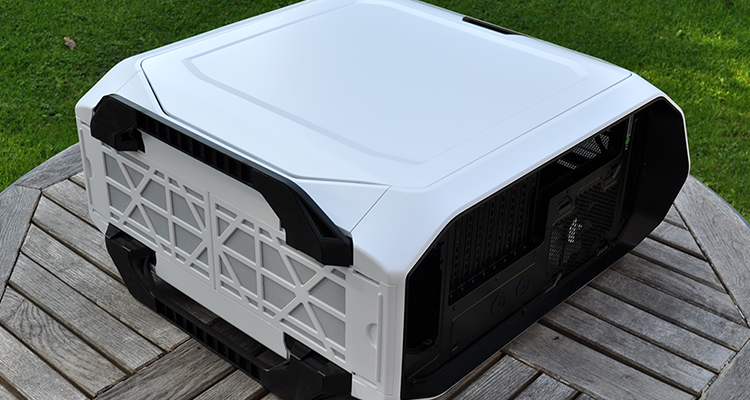 The quick-release mechanism on the 600T gets regular use here in the HEXUS labs - it's one of the main reasons why we still use the case - and Corsair has attempted to make it even easier this time around. 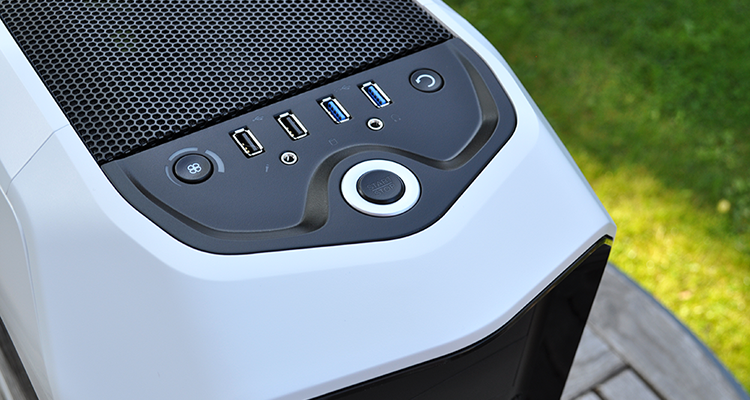 On the 780T, each side panel is governed by a single latch located centrally at the top of the panel. The latch is big and convenient, but it is made of plastic so we'll be interested to see how it holds up after long-term use. That's an important distinction to make. 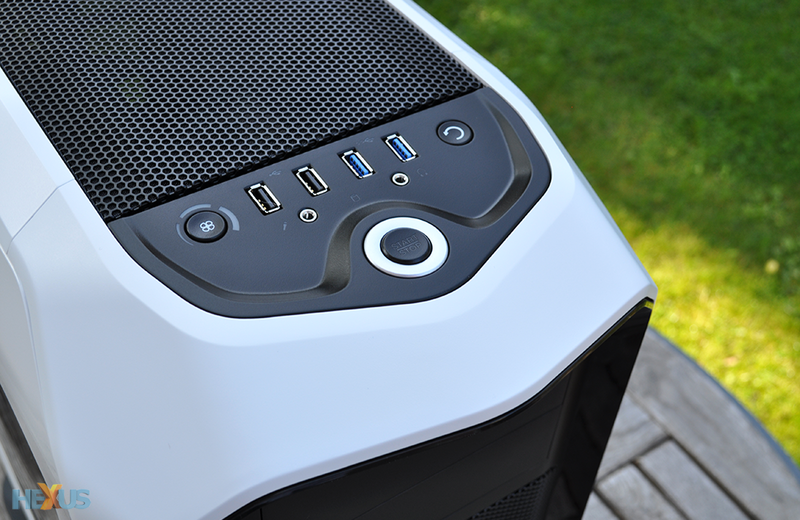 Whereas Obsidian Series chassis are mostly metal, the Graphite Series feels lightweight in comparison, and for a £140 case, the 780T might be deemed too plasticky for some. As you might expect on a chassis of this size, the moulded accents do exhibit a bit of flex, and getting the side panels to sit flush isn't always straightforward. If your rear cabling isn't tidy, the side panel may jut out on one side - a consequence of having a centrally-mounted latch.